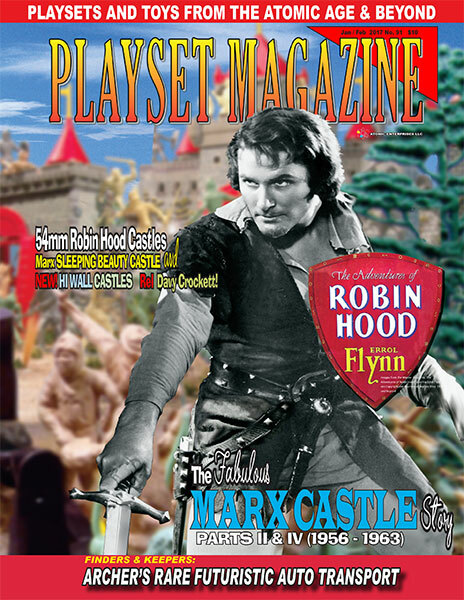 PLAYSET MAGAZINE ISSUE 91: MARX CASTLES PARTS 3 and 4! First we have not "one", but a "Two Part" special on the Castle sets! You get Part III, dealing with the 54mm Robin Hood sets (we covered the 60mm Robin Hoods, including the TV favorite Richard Green Robin Hood in issue 89). Then we progress to 1959, and the advent of the Sleeping Beauty Castles and the High Wall castles, in an edition written by Kent Sprecher and Clark Hoberman (we call this dynamic duo "Clark/Kent" for short!). It is a very detailed analysis of what happened to the Marx castles as the sets approach the mid 1960's. You'll get some great diorama photos featuring mint sets, a super prototype image of a never released Castle, and then there's a whole host of additional reading. You'll find, for your reading pleasure, some great shorter stories as well! There's the MPC "U.S. 7th Cavalry Set" Rich Fisher and "Is it Rel or Plasco: The Davy Crockett Set" by Greg Urbach. Then there's a new review on CTS' Korean War Chinese and Koreans with all the photos you need to see how well these will fit into your displays. A prime story on finding that perfect, long elusive item is David Schafer's Archer's Futuristic Auto Transport" with four futuristic cars. This set has peaked at around $2000 in recent years, but David found his -- and shows it in fantastic photos --including a mint, two-tiered carton with cars coming out of their garages to play for -- how much??!!! You'll have to read it to believe it!